As any fan of the font Helvetica (Glenn Sorrentino, no doubt) will know, Gary Hustwit’s documentaries are good food for thought. His 2007 independent film Helvetica, a rather notable recent example, took the fiftieth anniversary of this single, iconically-Swiss font and shaped an entire discussion around it in focusing on the art of visual communication through graphic design and typography in our modern, posterized, urban-aesthetic world. The full eighty minutes of insightful interviews from renowned designers such as Michael Bierut, Bruno Steinert and Lars Müller places this feature along the same lines as Phaidon and Die Gestalten Verlag in my home media library in terms of educational value elevated by a generous helping of inspiring eye-candy. Which is why I was so delighted to find out several weeks ago that Hustwit’s next full-length release is expected to premiere at the South by Southwest Film Festival at the end of March. And this time, the main object(s) of focus will be industrial design — yet another field that has tremendously impacted our living spaces, and dare I say probably even more so than graphic design. It’s fascinating that despite the extent to which our lives are determined by the use of objects we choose to buy and surround ourselves by, it still seems that many of us know very little about who made them and the creative processes that went into making them for mass-consumption in the marketplace. 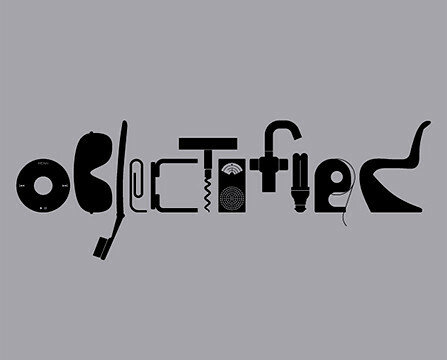 Objectified seeks to redress this issue, examining the realm of industrial design through the perspectives of both our interfacing with manufactured objects through our use of them, and reciprocally the industrial designers who design them for us to use. Hustwit defines objectified as having two meanings: one as being ‘treated with the status of a mere object’, and the other as representing ‘something abstract expressed in a concrete form’. Through exploring what ‘good design’ is, Hustwit is set to reveal a great deal about what such objects serve to reflect about us and our contemporary society — continuing the age-old form vs. function debate whilst highlighting the importance in understanding consumerism, identity, expression and sustainability in relation along the way. Once again, it provides insights of several of the industry’s greats, including interviews with MoMA curator Paola Antonelli, Apple’s Jonathan Ive (yes, the iPod designer), Naoto Fukasawa (MUJI audio), the IDEO design consultancy, and revolutionary designer Karim Rashid. Not himself being an expert in either graphic or industrial design, Hustwit’s refreshing approach undoubtedly provides a very much needed look at not only what design is or what it does, but rather what it means and what it may one day become. His interest in the profound way that industrial designers influence the threadwork of culture and interaction is one that many more people should be inspired to share. He asks, ‘If you could get all of these designers and design experts together at a dinner party, what would they talk about? […] Maybe there’s a third meaning to this title, regarding the ways these objects are affecting us and our environment. Have we all become objectified?’ And for a $500 donation, you can become one of ‘The Objectifiers’ whose names are listed in the credits — along with a DVD and other special merchandise thrown in the mix as objects of appreciation. Produced and directed by Gary Hustwit, edited by Joe Beshenkovsy, and shot by Luke Geissbuhler.